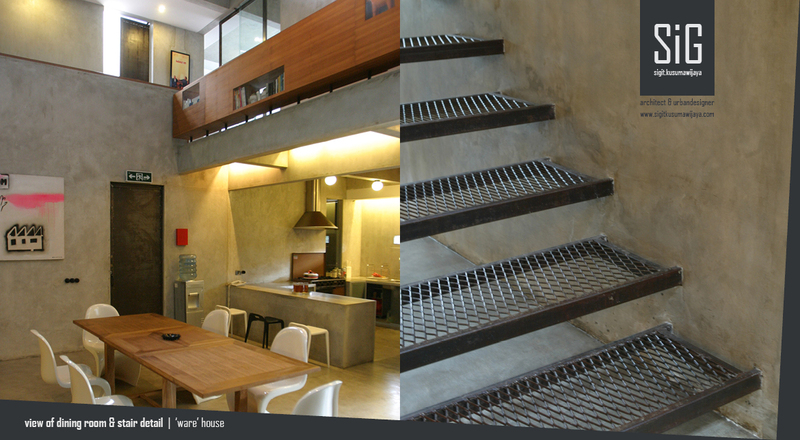 This project was designed officially by Andra Matin Architect (Jakarta) on 2004-2005. As a project architect, I tried to translate the client’s will to have his house look like a factory. We call this house as a “WAREhouse” for its concept. This 200 m2 house uses many unfinished materials to represent the concept. For its facade it uses perforated metal material with rust iron finish to make a “HARD” image. 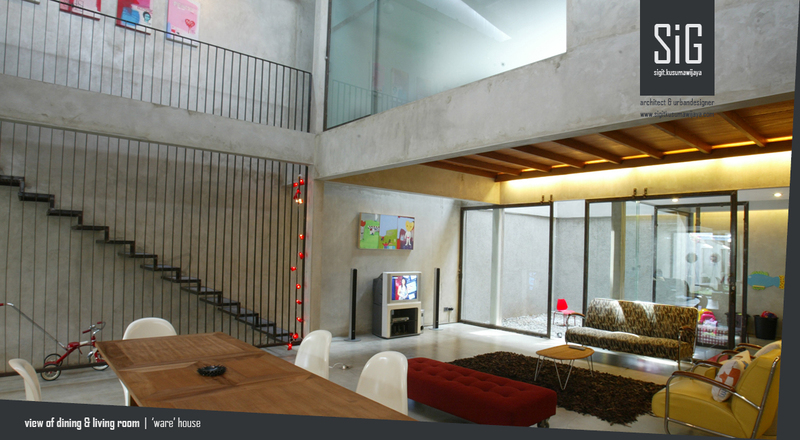 Other materials that are used for this house is refined plaster cement finish for wall without color painted and also for floor to make the interior more natural. The material of door and window frame are also use rust iron finish that still remain the natural dark blue color of the metal. The ceiling uses exposed steel frame in the living room and exposed wood in some rooms. Located in East part of Jakarta which known as its high tropical temperature, this house uses cross ventilation and two big voids to flow the wind across through the house. These big voids also make the interior looks wider even-though the site area is not too large so that their kid can play freely. Many rust iron finished materials are used in this house to emerge its artistic image. One of the element that use rust iron finish is the stair which is protected by thin plate balustrade that stretch from the floor until the half of house height. The stair step uses perforated steel plate which is usually used for catwalk in the factory. The exposed steel frame on the ceiling is also remained the color as its natural color. The aluminum foil and glass wool is inserted between the ceiling and the metal deck roof on the top of the house to reduce the heat. 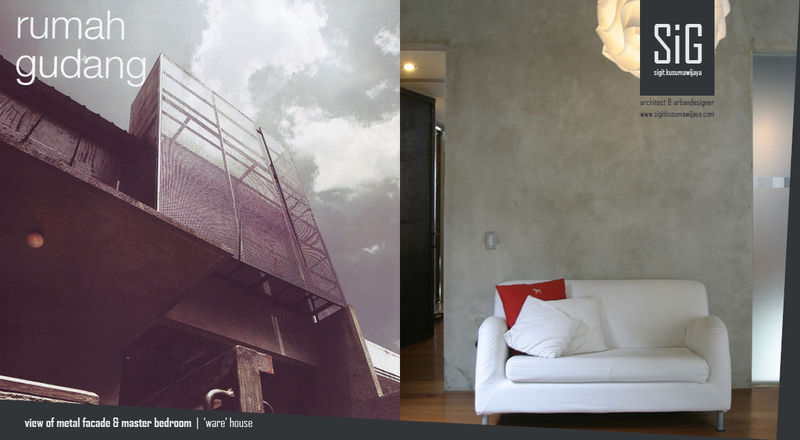 Grey become the basic color of this house as can be seen at the floor and the wall. Its floor is finished with smooth plaster cement with grey floor hardener material to make this floor look glossy and easy to clean. The wall is also finished by its natural grey color to emerge its artistic image. This project also uses many sun light games to eliminate the electricity use in the afternoon. Transparent glasses are put in the wall that is adjacent to the outside. The purpose is to let the sun light come into the house as much as possible. 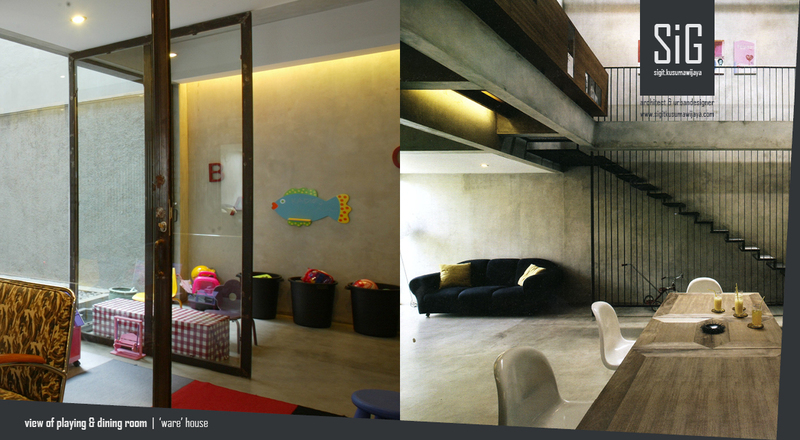 The first floor child room which is also adjacent to the outside in front of the house use transparent glass too. However, the building face to South West direction that means almost get the sunset light directly from the west. To reduce the direct sunset light, near massive iron plate is used in the facade. But as it is said on the top of this page, this near massive iron plate is perforated to still let the sun light come into the room dramatically. 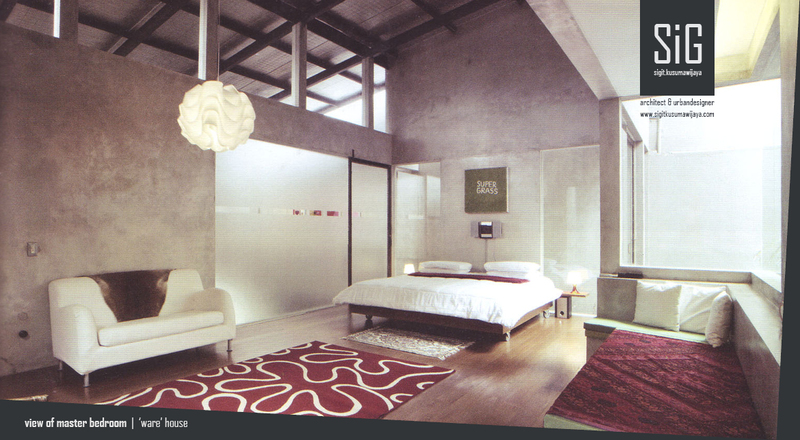 The sandblast glasses are used in the private owner’s room like master bedroom and bathroom. This sandblast glasses still can be opened to let the wind flow across the room. The project was successfully finished within one year with not spend a lot of budget to build if it is compared with the normal house price in Jakarta. Instead this project budget is quite cheap than others which has the same wide. Both the architect and the clients are satisfied with the design and the house application itself. This project also has been published in one of the architecture tabloid in Indonesia, called RUMAH Tabloid on 2006.